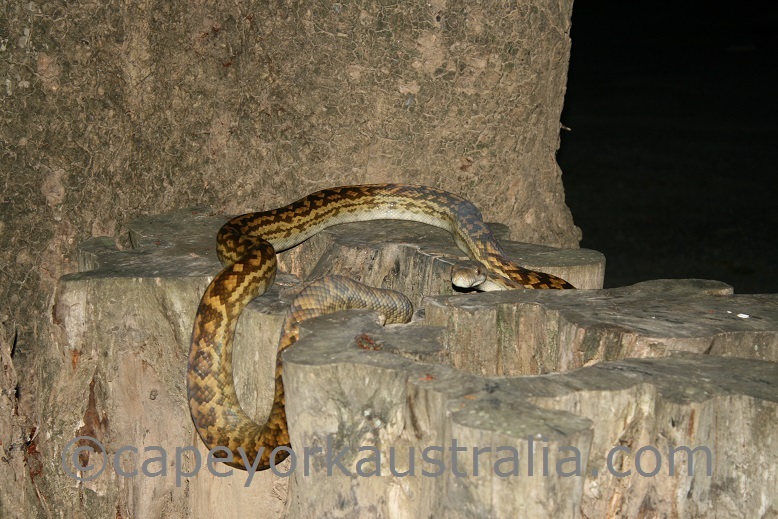 So which Australian snakes are found in Cape York? 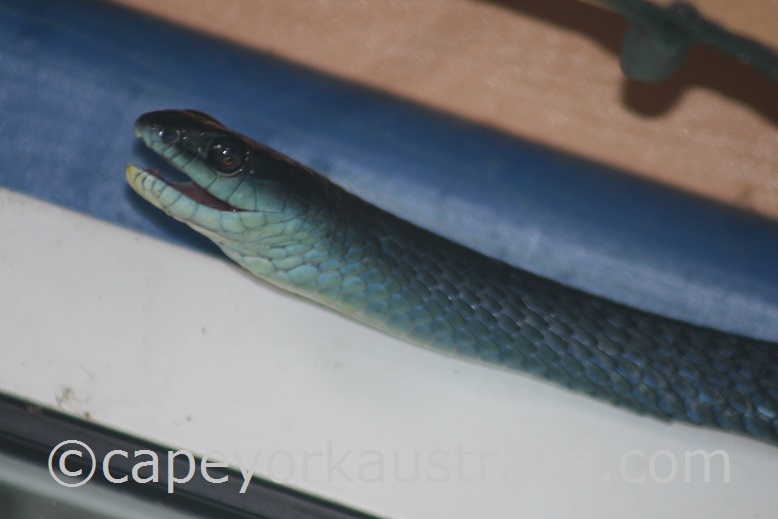 Australia is a country very rich in reptile fauna, and snakes are no exception. It is also known as a country for poisonous snakes, however they are not very common to come across, and most of them are shy animals. How else would we feel safe camping and roaming around in the bush all the time? While there are many snakes in Cape York, including some poisonous ones, on your trip you are most likely to see the perfectly harmless black headed python. 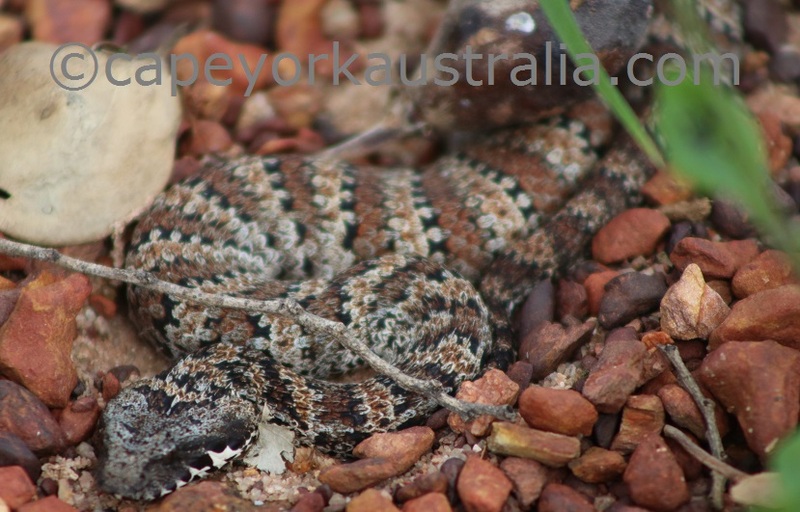 It is a very common snake in northern Australia, including the Cape York peninsula, and it is often around in the daylight, so it is easy to spot. It has a striped body and a distinctive black head. But what other Australian snakes are found here, and which ones are non venomous? The three large groups of Australian land snakes include pythons, colubrid snakes and venomous snakes. All are found in the Cape York area. Pythons are the largest of all types of snakes in Australia, and they take large prey which they kill by suffocating. So, they don't need venom. Some of them may still give you a bite that gets infected, but they are not poisonous. 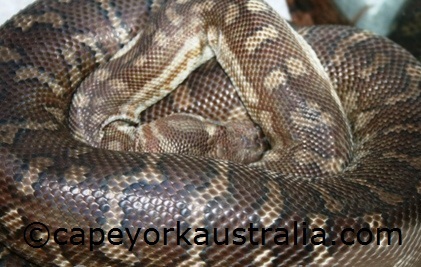 Out of the 13 species of pythons in Australia, on the Cape York peninsula you find the already mentioned Black Headed Python; as well as Spotted Python, Water Python, Carpet Pyhton, Olive Python, and two very special ones - the Amethystine Python - the largest snake in Australia; and the Green Tree Python, which is only found in Cape York's eastern rainforests and nowhere else in Australia. Colubrid Snakes is another group of non venomous snakes, and in Cape York you find the Brown Tree Snake, Common aka Green Tree Snake, Northern Tree Snake, Macleay's Water Snake, Freshwater Snake, Richardson's and White Bellied Mangrove Snake; Slate Brown and Slaty Grey Snake; Australian Bockadam and Keelback. Poisonous snakes (aka Elapid snakes, which is the name of their family) that are found on the Cape York peninsula, include Coastal Taipan, Eastern Brown, Western Brown, King Brown and Northern Death Adder, as well as Red Bellied Black Snake, Myall Snake, Rough Scaled Snake and Eastern Small Eyed Snake. Most of those snakes are rare to come across, and they also tend to be shy animals and move away from you when they hear you coming. Almost all snake bites happen about at ankle-height, so wearing long boots that are thick enough is a good protection. Not nearly all our snakes are poisonous, in fact the majority are non poisonous, (or at least not poisonous enough to kill humans). You cannot rely on it every time, but if you want to generalise, many snakes with no venom have a few things in common. 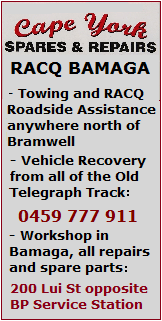 * Australia's largest snakes (pythons) are not poisonous - so a large snake is likely a harmless one. * If you see a snake in a tree, on a building or anywhere much above the ground, it is likely a harmless one as Australian poisonous snakes tend to be ground dwellers and often reluctant to leave the ground. * The poisonous ones also generally tend to be more alert and nervous. 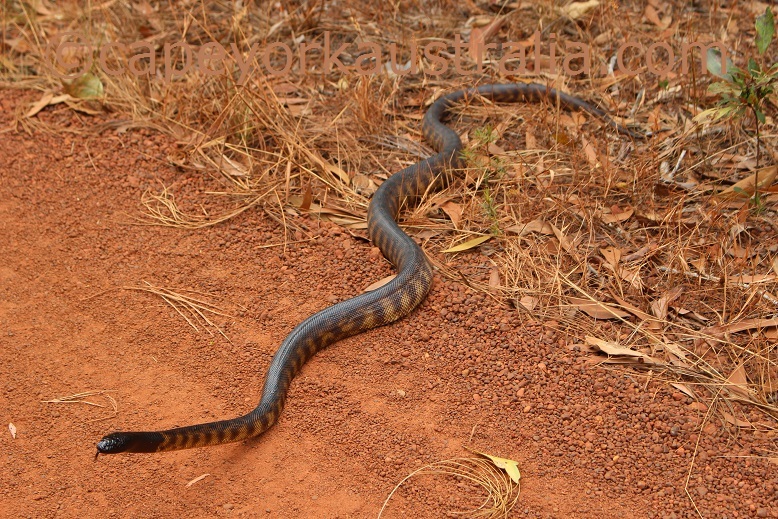 Pythons are the largest Australian snakes and they are not venomous. 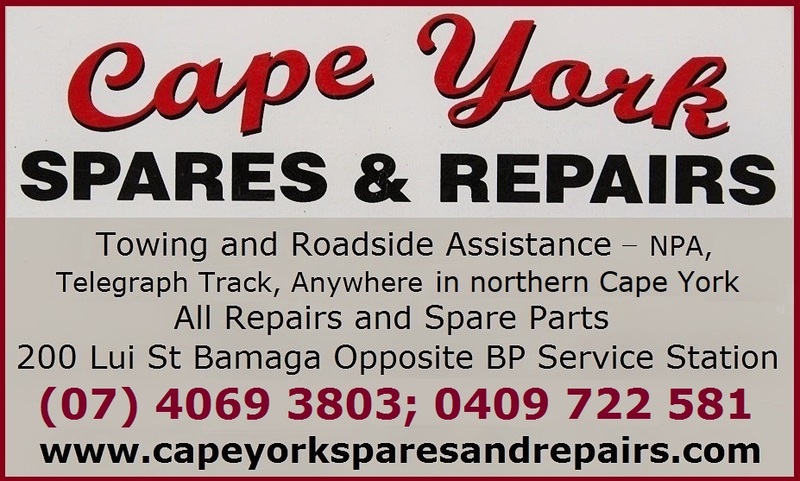 In Cape York, we have black headed python, spotted python, water python, amethystine python (Australia's largest snake) olive python (the second largest), and the endemic green tree python, only found in parts of the Cape York peninsula. The other group of non venomous snakes is colubrids, that include the tree snakes (that are not pythons). 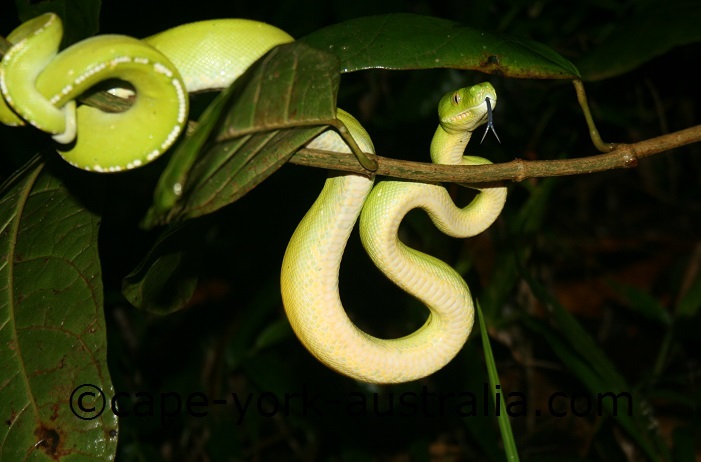 In Cape York, we have green tree snake, brown tree snake, northern tree snake, Macleay's water snake, Richardson's and white bellied mangrove snake; slate brown and slaty grey snake; bockadam and keelback.